As you know we love Audient at Produce Like A Pro! A couple of months ago they sent us their new ID44 and I’ve been so excited to try it. The ID44 is their most advanced IO. Basically it can run 2 sets of 8 channels into it, which with the 4 mic-pres in it, would give you 20 inputs. I’m going to use it exactly as it is, a 4 input system. We’re going to do a kick, snare, an 2 overheads on a drum kit, mic up an acoustic guitar, a piano, bass, and of course a vocal. Our good friend David from The Workday Release is here and is going to be the guinea pig, I mean artist. – It’s going to be a lot of fun! The other great thing is you can enter to win this beautiful IO! Audient has been very generous with us over the last couple of years. They’ve been letting us try a lot of their newest stuff. We love their mic pres, and how they sound. I’ve watched a couple other reviews and they seem to be very favorable of this ID44, so lets open it up! The box comes with free software and plugins! – Oooh I like that. The manual is nice and short for people like me who probably won’t read it anyway! haha! Nice, simple, yet pretty substantial. It’s small but heavy. There’s definitely some good hardware in there. There are also DI and headphone inputs on the front- it might seem like a really obvious thing to do, but I’ve used equipment before with the inputs on the back and trying to hold a guitar and reach around to plug it in blind is not fun. I like the idea of having equipment set up and ready to go, but if I need to change a bass or guitar then I want that to be easy to get to. So putting those on the front makes life so much easier. I think the capabilities of using 4 mics on the kit for me is a great sound. It sounded really really super powerful; they’re great mic pres. I’m a huge fan, the console is wonderful and the fact that they’ve taken that information and put it into little device like that is rather nifty. 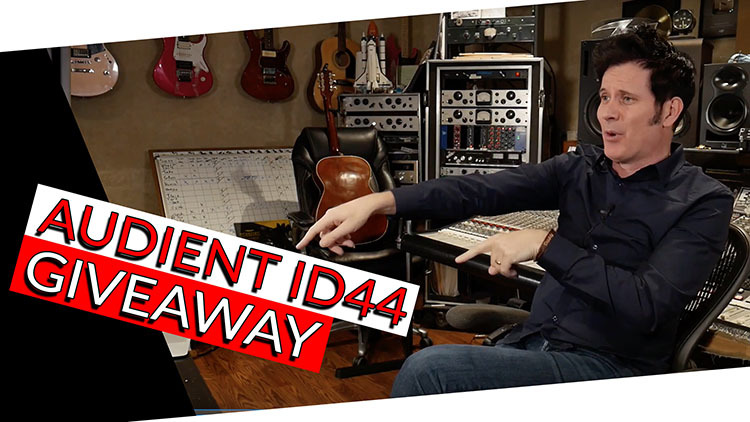 Thank you ever so much Audient for letting us giveaway the ID44 that is a really wonderful machine. Of course, you can win it! Don’t forget to enter the giveaway!